The fundraiser takes place at Park West Loft 38 Oak Street in Ridgewood, NJ from 7:30-11:30pm and costs $65, which includes a two-hour open bar, passed hors D'oervres, pasta station, salad and desssert. Committee member Jim Suozzo says, "You'll have a good time and meet people you may not have met otherwise. Most importantly, you will be supporting the arts in this community." The party is sponsored by Super Cellars and Pearl Restaurant. The event is a fundraiser for the festival which awards prizes in several genres of film and also gives a $500 scholarship to the director of the best film by a student. The successful and growing Ridgewood Guild International Film Festival is going into its 9th year. Last year the festival hosted a film premiere, known actors, foreign films, shorts and movies and music videos by local and regional filmmakers. This well-known film festival is being internationally recognized for its hospitality. This year on tap are some recognizable film actors, Hollywood producers, TV stars and some surprises. The festival takes place in Ridgewood and is very reasonably-priced compared to other festivals. For updated information visit https://ridgewoodguildfilmfest.com/. Submissions are still being accepted for the Festival through Film Freeway. Mark your calendar to check out this festival which this year will have its main nights on April 24th and 25th at the Bow Tie Cinema in Ridgewood starting both nights with Red Carpets at 6pm. There will also be World Film Night and Foreign Film Night in the auditorium at the Ridgewood Library on Apil 10th and 18th respectivly and Human Rights Nights at the Unitarian Church in Ridgewood on May 10th and 11th. This year's Signature Film Festival Sponsors to date are Boiling Springs Bank and TEEEM. 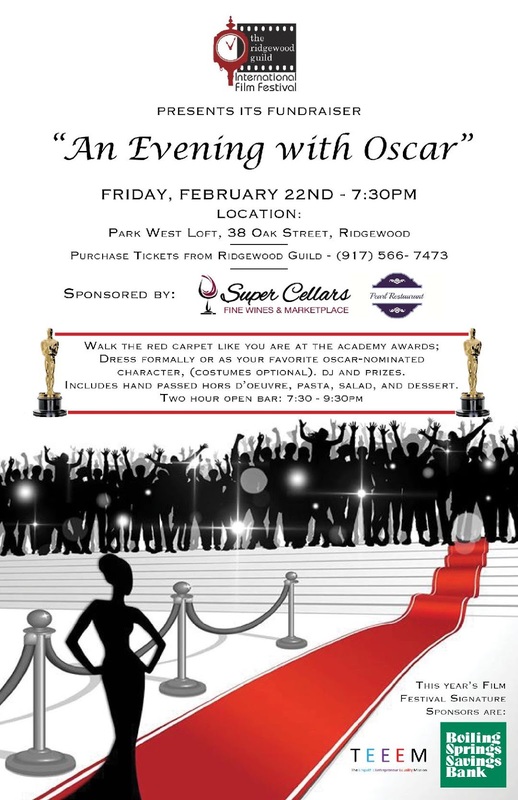 For more information on the fundraiser, the festival or to RSVP or on the festival contact President Tony Damiano at 201-493-9911 or visit https://www.ridgewoodguild.com/events/film-festival/.